Hole, macular: A hole in the macula, the tiny oval area made up of millions of nerve cells located at the center of the retina responsible for sharp, central vision. The eye contains a jelly-like substance called the vitreous. Shrinking of the vitreous usually causes the hole. As a person ages, the vitreous becomes thicker and stringier and begins to pull away from the retina. If the vitreous is firmly attached to the retina when it pulls away, a hole can result. 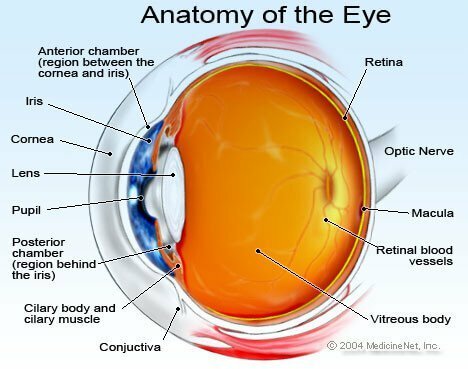 The size of the hole and its location on the retina determine how much it affects vision. Generally, people notice a slight distortion or reduction in their eyesight. However, if the hole goes all the way through the macula, you can lose a lot of your central vision and therefore your detailed fine vision. A surgical procedure called vitrectomy is often used to treat holes that go all the way through the macula. The vitreous is removed to prevent it from pulling on the retina. It is replaced with a gas bubble that eventually fills with natural fluids. Following surgery, patients must usually keep their faces down for two or three weeks. This position allows the bubble to press against the macula and seal the hole. Vitrectomy can lead to complications, most commonly an increase in how fast cataracts develop. Other less common complications include infection and retinal detachment during surgery or afterwards. Vitrectomy is about 90% effective in closing the hole. However, improvement in people's vision is more variable. More than half of those who have the surgery can expect an improvement of two lines or more on the vision chart. Very few people get a macular hole in the second eye. A macular hole may also be called a macular cyst, retinal hole, retinal tear, or retinal perforation.